On September 11 2008, Warrant Officer Dominic Hagans of the 1st Battalion the Royal Irish Regiment became the latest casualty of the Afghan war when an improvised enemy bomb exploded under his vehicle, wrecking his legs and changing his life forever. As he embarked on the long road to rehabilitation and partial recovery, WO2 Hagans decided to record his experiences and those of some of his comrades in print. 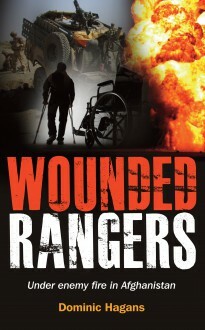 Wounded Rangers is a compilation of no-punches-pulled true stories from the front line, plus the heart-rending story of a mother whose son was critically injured on the battlefield. Harrowing and often shocking as these accounts are, the professional soldier’s determination to do his duty and his indomitable sense of humour shine through. All the proceeds from this book will go to the welfare fund of the 1st Battalion the Royal Irish Regiment, to help meet the cost of caring for their wounded and helping them to adapt and adjust to their injuries.